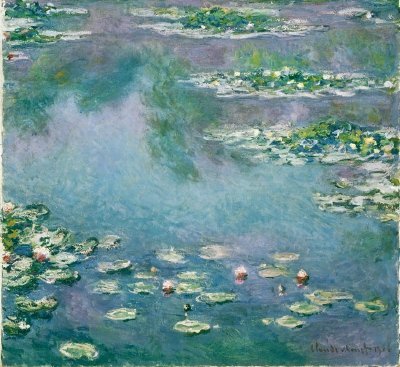 Knowing more about color will help you lay out a palette at the beginning of your painting session. Each scheme has a different “mood” attached to it and can make your colors more harmonious throughout the work. We talked about this a little bit in Basic Color Theory, but here’s an extended look at colors and how they can affect your painting. Colors play tricks on us. 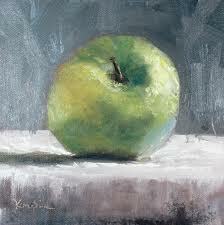 One of the most important things I was ever told by an art instructor is “Paint what you see—not what you think you see.” When you start painting an apple, for example, you think, “Well, the apple is red. So I’ll paint with red.” What’s wrong with that statement? Everything. 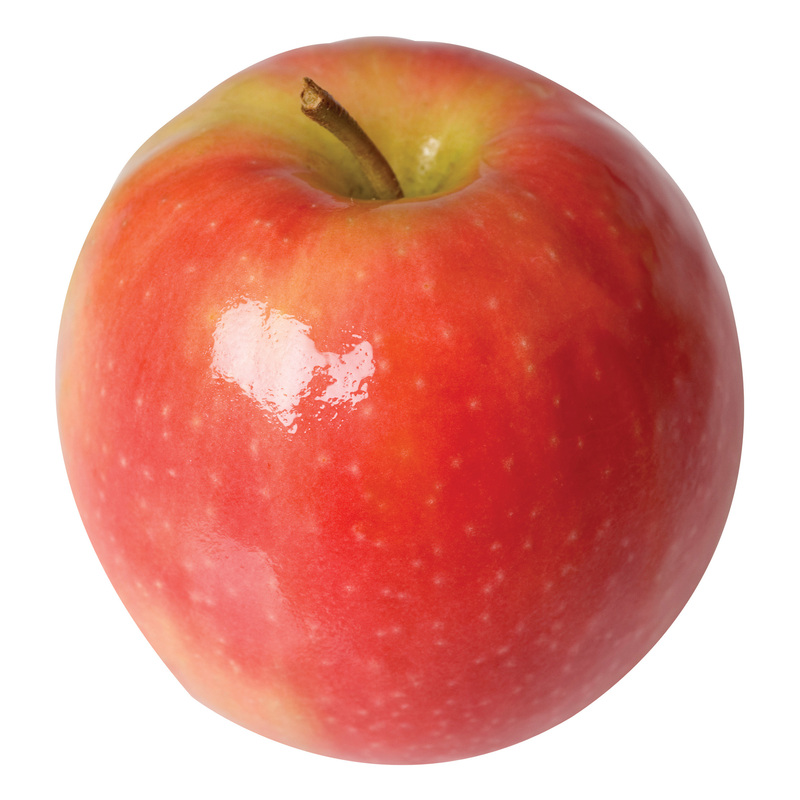 Yes, apples are red. But the way we see colors and the way we think we see colors are totally different. A very good exercise for figuring out a thing’s actual color is to take a small piece of white paper or cardboard, a business card will do, and cut a small square hole in the center. 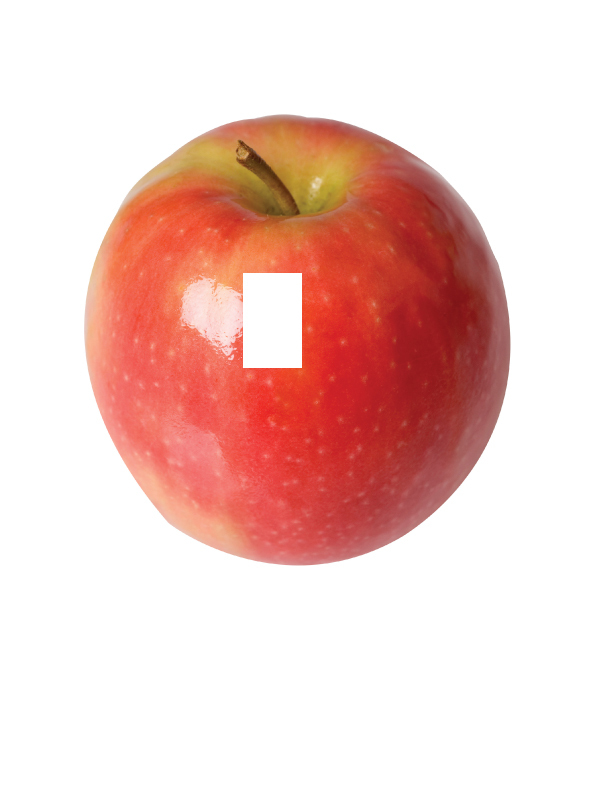 Hold this up to the object you’re painting and isolate the colors. They will look very different than you thought! Can you see all the different shades of red in it? Let’s see some of them isolated. The first two look pretty red, but the last two look more pink. We can see that the highlight isn’t actually white. 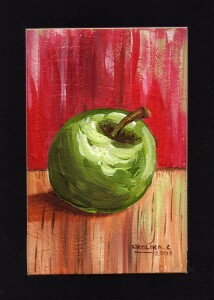 Not letting your mind play tricks on you is the fastest way to become a great painter! Colors also seem to change based on their surroundings. Which of these orange squares is darker? Trick question! They’re the same color. They just look different because the background has changed colors. It’s important to keep these optical illusions in mind when painting, as knowing these things will keep your work from looking amateurish. Another hard one to grapple with is water. It’s blue, isn’t it? Let’s try. Go to your kitchen right now and get a glass of water. Look at it. Is it blue? The ocean is blue because water absorbs colors in the red part of the light spectrum. Like a filter, this leaves behind colors in the blue part of the light spectrum for us to see. Most of the ocean, however, is completely dark. Hardly any light penetrates deeper than 200 meters (656 feet), and no light penetrates deeper than 1,000 meters (3,280 feet ). That water is mostly yellow! There’s hardly any blue in it at all. Remember this when you start painting and know that your mind will play tricks on you, but if you let them, your eyes will show you the truth. Depth and mass can be difficult things to show in a flat or 2-dimensional work. 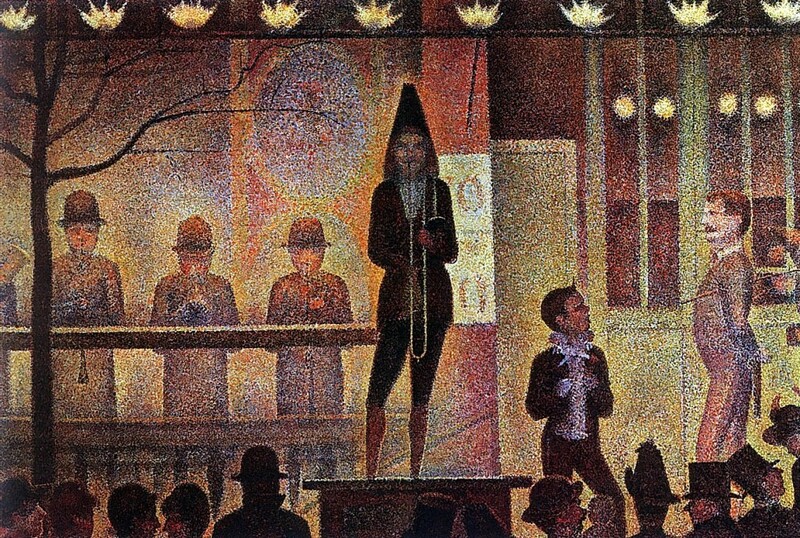 Because the canvas is flat, we have to employ optical illusions to suggest depth and mass. We have already discussed in Basic Color Theory that objects closer to us tend to be warmer (temperature) and darker (value) while things further away are cooler and lighter. 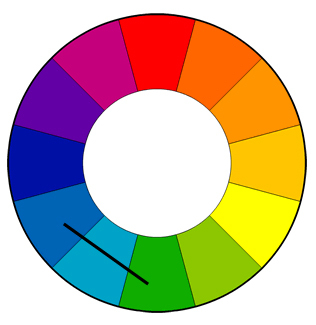 Before you add brown or black to your color to get a darker value, remember the color wheel. You’ll get a richer, more natural looking dark color if you add the color’s complement. Squint your eyes and look at the man’s face. The darkest parts are under his jaw line, his mustache, and his eye. The jaw line is easiest for us to take apart because it is the largest area. 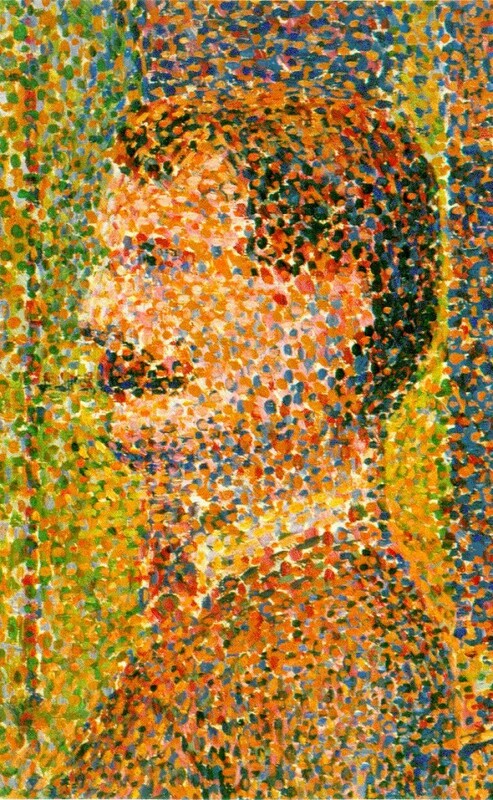 The rest of the man’s face is comprised of orange and yellow tones, so to neutralize that, Seurat adds purples and blues (the complements of yellow and orange) to the jaw. This makes it appear to recede into space. Remember this when you start painting—it will take your work to the next level! Since we’ve been talking about complementary colors so much in our “Basic Color Theory” lesson, let’s look at some other color wheel relationships or color schemes. Complementary: As we discussed in our color wheel lesson, complementary colors are across from each other on the color wheel. Example: blue, orange. When mixed together, complementary colors can neutralize each other. But placed next to each other, they can make the other appear more vibrant and if not used sparingly can be jarring. If you’re wanting this effect in your work then, by all means, use this scheme, but if you’re wanting to depict a serene landscape, you’re better off with another color scheme. Analogous: Analogous colors are three colors next to each other on the color wheel. 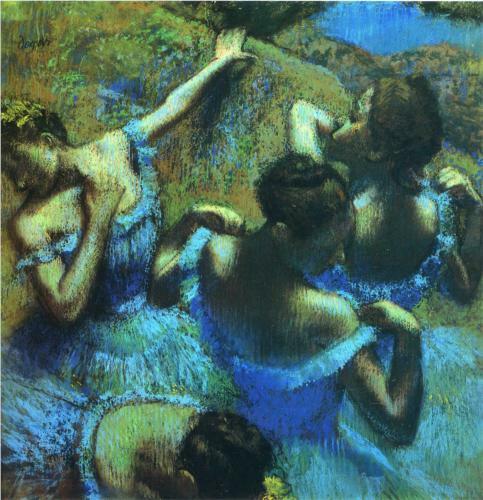 Example: blue, blue-green, green. 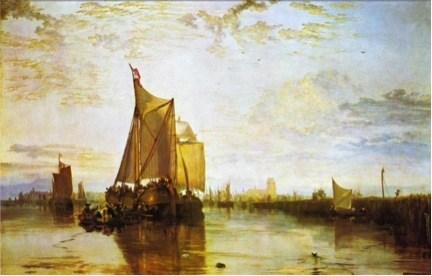 This analogous color scheme example is very peaceful. It’s often found in nature and is pleasing to the eye. 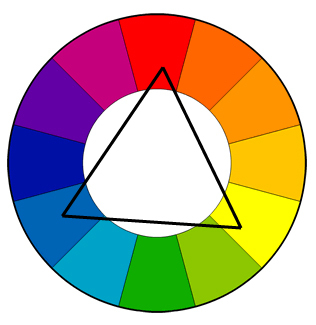 Triadic: Triadic colors are evenly spaced on the color wheel. Imagine putting an imaginary triangle on top of the color wheel. 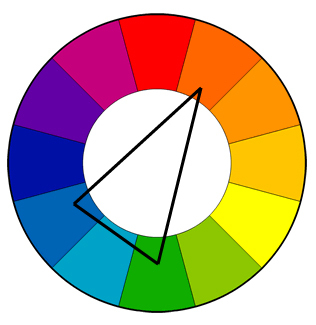 The three colors the points touch will be part of the same triadic color scheme. 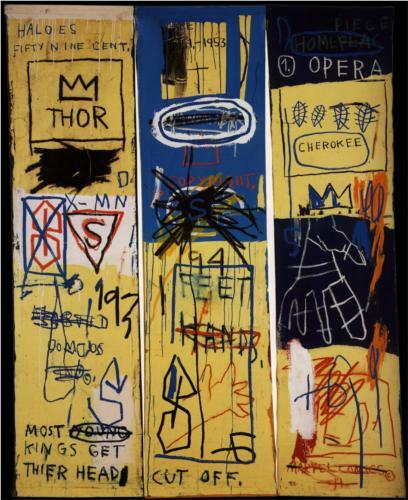 Example: yellow, blue, red. Split Complementary: This is a variation on the complementary color scheme. It involves a base color and the two colors on either side of its complement on the opposite side of the color wheel. Example: green, blue, red-orange. This scheme has the same visual contrast as the complementary scheme, but carries less tension. This is a good scheme for beginners. Tetradic: Tetradic, or sometimes called rectangular, color schemes involve two sets of complementary colors. Imagine laying an invisible rectangle over the color wheel. The colors each point touch will be part of the same tetradic color scheme. Example: Green, blue, red, orange. Because you’re working with two sets of complementary colors, this scheme has a lot to offer. It works best if you let one color dominate and are conscious of your balance of warm and cool colors. In the image below, de Kooning is letting the green dominate (it takes up the most space) and is accenting it with other colors. 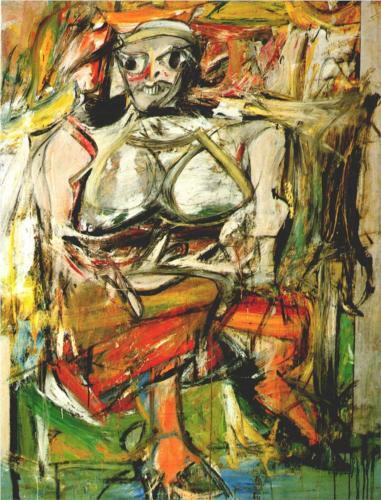 Willem de Kooning, Woman I, 1952, oil on canvas. 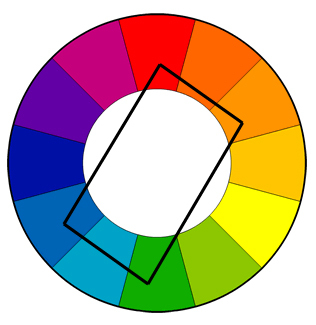 Square: Similar to tetradic, but all the colors are evenly spaced along the color wheel. You’ll have two sets of complements as you did with the tetradic. Again, imagine an invisible square placed on top of the color wheel—each of the square’s corners will point to another color in the scheme. Example: red, yellow-orange, green, blue-purple. As with the tetradic scheme, you’ll have two sets of complementary colors and thus a lot to work with. It works best if you let one color dominate and are conscious of your balance of warm and cool colors. 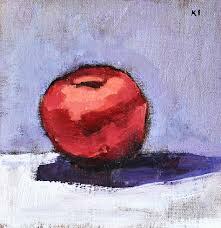 Try painting a simple image of your choice using differing color schemes. 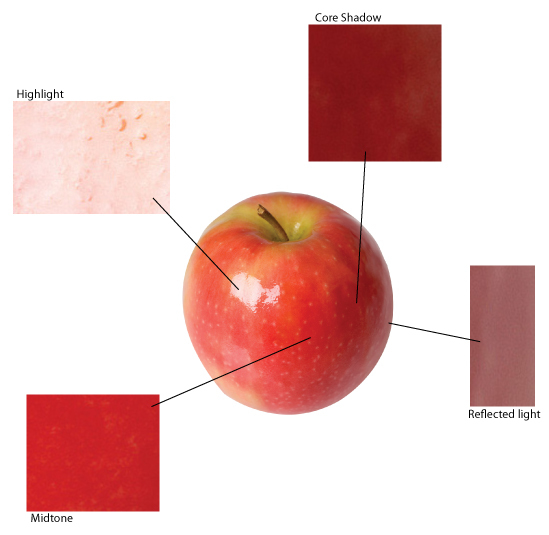 This exercise is all about using colors, not about painting the object accurately. Grab a few canvases or pieces of paper (at least two but the more the merrier) and pick out a color scheme for each. What is the effect of each color scheme? 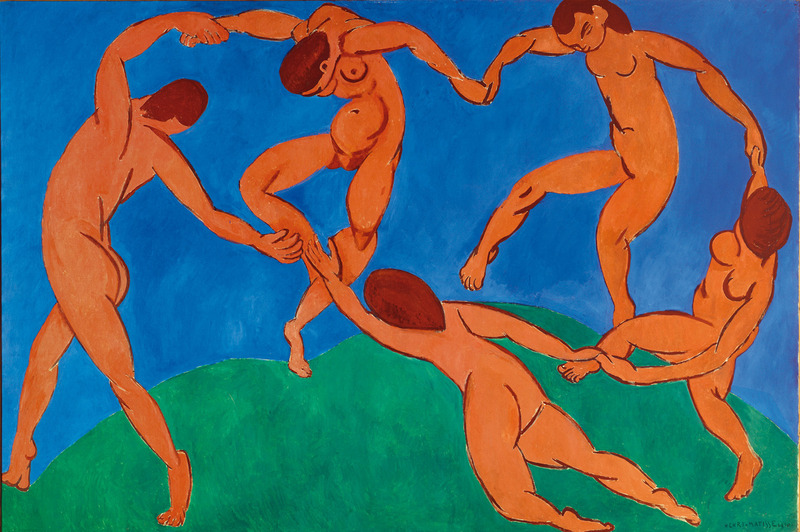 How does each of these paintings make you feel? 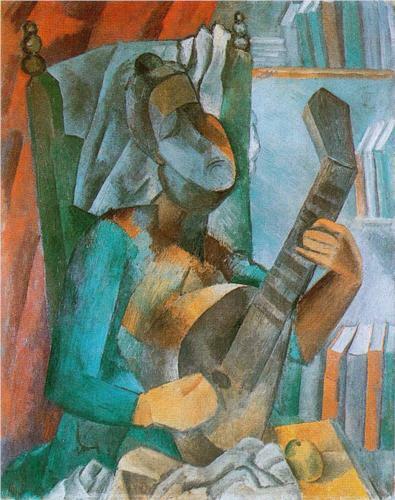 Do the colors change the mood of the painting? Ask a friend or family member to look at your finished paintings and have them tell you how each color scheme makes them feel. 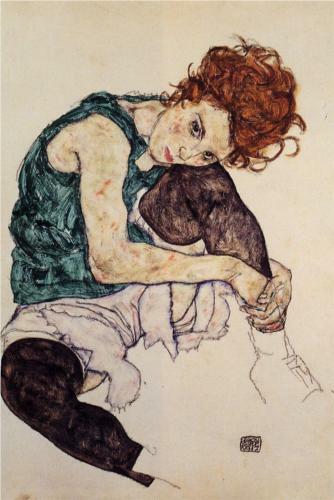 When you’ve finished with your paintings and received your feedback, share it with us! Submit photographs of your works using our submission form here and let us know how people reacted to your different color schemes using the comment box! You’ve learned about the importance of trusting your eyes, and the use of the color wheel in choosing colors to make a painting interesting. Another helpful segment! Thank you! it took me a minute to realize just the points of the shapes…not using the whole line of the shape…hope that makes sense…very helpful!